(CNN) -- The threat of a tsunami prompted the U.S. National Weather Service to issue a warning for at least 50 countries and territories after an 8.9-magnitude earthquake struck Japan Friday. The wide-ranging list includes Russia and Central American countries like Guatemala, El Salvador and Costa Rica and the U.S. state of Hawaii. The weather service's bulletin said it was intended "as advice to government agencies." The quake, which struck near the coast of Honshu, Japan on Friday afternoon, unleashed a wall of water that rushed in toward land, leveling houses and bashing cars in its path and apparently killing hundreds. Some officials feared that the fast-moving waves from a tsunami could be so high that they would wash over entire islands in the Pacific, a spokesman for the International Federation of Red Cross and Red Crescent Societies said Friday. There was some good news on the island of Guam, where the tsunami warning was lifted. Police reported no damage or injuries. Indonesia also lifted its warning. "Experts are saying that it could be anywhere from 4 to 10 meters. That's higher than some of the Pacific islands are above sea level. We just have to do the calculations to see that this is a real threat," federation spokesman Paul Conneally said. "In a situation like this, we have to prepare for the worst case scenario," he added. But Gerard Fryer of the Pacific Tsunami Warning Center said even though waves could cause significant flooding, "washing over islands is not going to happen." Tsunami waves can travel at speeds of 800 kilometers per hour. "The tsunami is more than one wave, and the waves can be separated by 20 minutes or half an hour. So just because you see a wave come up and then go back in the ocean again, that doesn't mean it's over," Fryer said. Sirens sounded in Hawaii around 10 p.m. Thursday (3 a.m. ET), warning residents they could expect tsunami waves five hours later. The Pacific Tsunami Warning Center said Kauai was the first Hawaiian island hit by the waves, which swept across the remainder of the island chain as six foot surges pushed waves ashore. Officials said such ocean surges can push water as far as a quarter of a mile inland. The West Coast and Alaska Tsunami Warning Center early Friday issued a tsunami warning for coastal areas along the United States and Canadian west coasts. The tsunami warning includes coastal areas of California and Oregon from Point Conception to the Oregon-Washington border. It also includes coastal areas of Alaska from Amchitka Pass to Attu. Wendy Watson-Wright of the United Nations Educational, Scientific and Cultural Organization warned nations to be on alert. "This is a massive one, and it will have different effects depending on the location, on the seabed, and on other sorts of characteristics," she said. "But clearly this is very very large, and from that perspective, all countries need to be alert, on standby for the moment." In the Philippines, the government has evacuated 20 coast areas. Officials said they were getting reports from Isabela province of "unusual waves" hitting the coastline. The country's Disaster Management director Benito Ramos said waves have hit the coastal areas of Aparri, Cagayan and Basco, Batanes. Ramos said the tsunami alert remained elevated to a level two across the country as a precaution. "We remind everyone who lives in the region to monitor their local news for instructions from their state and local officials and if told to evacuate -- evacuate," said Administrator Craig Fugate. Chip McCreary of the Pacific Tsunami Warning Center said officials estimated the quake was already causing waves with magnitudes of up to 2 meters above normal sea level. "This is a very large earthquake. We've evaluated it as about the same size as the earthquake last year in Chile. However, it's much closer to the Hawaiian islands than the Chile earthquake," he said. Waves are expected to begin hitting both Australia's and Chile's coastlines at around noon ET. The National Weather Service list includes Japan, Russia, the Philippines, Indonesia, Papua New Guinea, Australia, Fiji, Mexico, New Zealand, Guatemala, El Salvador, Costa Rica, Nicaragua, Panama, Honduras, Chile, Ecuador, Colombia, Peru and the United States. Numerous Pacific islands, including some U.S. territories, are also on the list. Friday's 8.9-magnitude temblor in Japan was the largest earthquake since a 9.0-magnitude earthquake struck the Banda Aceh area of Indonesia on Dec. 26, 2004, causing a massive tsunami that killed about 250,000 people in 14 countries and washed away entire communities. The tsunami caused nearly $10 billion in damage and more casualties than any other tsunami in history, according to the United Nations. The earthquake, initially reported as a 7.8 earthquake, was upgraded to an 8.9 quake. "When you jump a magnitude from 7 to 8.9, it's not 10 times stronger, it's 1000 times stronger," said CNN International meteorologist Ivan Cabrera. 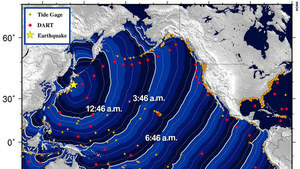 "With an ... earthquake that shallow, that close to shore, there will be more than one tsunami."